I just finished reading Catwoman: It's Only a Movie, and if it weren't for the fact that I've already pre-ordered the next volume, Catwoman: Catwoman's Dead, Catwoman would be bumped with Hawkgirl to my wish list--that is, comics I won't spare the money to purchase myself. As with Catwoman: The Replacements, it's not as though writer Will Pfeifer is doing a terrible job. His Catwoman, at least, remains a morally conflicted anti-hero, and Pfeifer writes believable, spot-on dialogue. There's even a bit in the middle, when the father of Catwoman's baby is revealed, that's as emotionally harrowing as anything the Ed Brubaker-written Catwoman had to offer. But around that interesting middle section are a bunch of stories that just feel flat. The first part involves the villain Film Freak, whose one-note film obsession gets far too much screen time (Pfeifer himself is a film guru, and I appreciate the authenticity, but in the book it feels like trivia for trivia's sake). 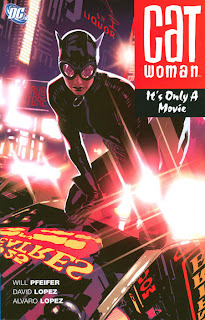 Following it is a heist story that's good, but contains enough science-fiction elements that it doesn't feel like a hard-boiled Catwoman crime story (letting alone when Pfeifer sends Catwoman up against a giant ape). It's a "heist of the month" story, essentially, that could star any of a number of anti-heroes; there's little about it that makes it feel distinctly like Catwoman. Pfeifer, to his credit, does offer believable reasons why Catwoman must work on both sides of the law. With her friend Holly falsely accused of a crime by corrupt police, and Selina herself to blame for the crime, she momentarily considers seeking help from Oracle before instead turning to the Calculator. This choice of two computer gods, one good and one evil, perfectly positions Catwoman in the middle, and proves Pfeifer has a good handle on the character. Sadly, this is not nearly enough to add relevance to Pfeifer's story, but truly it's the plot, and not the writing, that's to blame. As before, the art team of David Lopez and Alvaro Lopez present detailed art that avoids the common female-heroine trap of being over-sexualized. I also appreciate that the art team has drawn every issue of the entire past two trades, and it looks like they may be on an unbroken run; in this age of shifting art teams, this loyalty to the title is gratifying. Adam Hughes's covers, on the other hand ... I know Hughes is a comics legend, and certainly he draws miles better than my stick figures, but his over-the-top cheesecake covers are just silly. Are we really to believe Selina and Holly ran away from the police with their costumes zipped down and their breasts popping up? Does DC seriously believe anyone purchases a Catwoman comic solely based on Hughes's flesh-tease covers? I appreciate the artistry here, but I can't help detect a hint of ridiculousness. So all-in-all, no offense to Will Pfeifer, who's writing I've liked before, but not a great Catwoman experience. And trade paperbacks, with the rise of hardcovers, have just become too expensive lately to purchase books that don't excite or otherwise tie into what else I'm reading--though with the fourth new Catwoman volume to tie into Salvation Run, we'll have to re-examine things then. Anyway, thanks for reading, and stop back again for more reviews! I agree that the film references felt as forced as the musical name-dropping in Juno, but I enjoyed it for the highly self-conscious storytelling as the Film Freak narrated the first, second, and third acts of his film, which correspond to the comic book story arc itself. But I'm surprised Pfeifer's pre-One Year Later run (#44-52) hasn't been collected, especially since it featured gorgeous art by Pete Woods whose style suited Catwoman's leather costume even better than his OYL Superman gig. I'm glad I picked it up in single issues when I had the chance before switching to trades at the OYL point.